A series of major breakthroughs have been achieved in the case of Macau real estate businessman Ng Lap Seng’s bribery of John W. Ashe, the former president of the United Nations General Assembly. This and other corruption cases in Macau have been linked to the Jiang faction of the Chinese Communist Party (CCP). 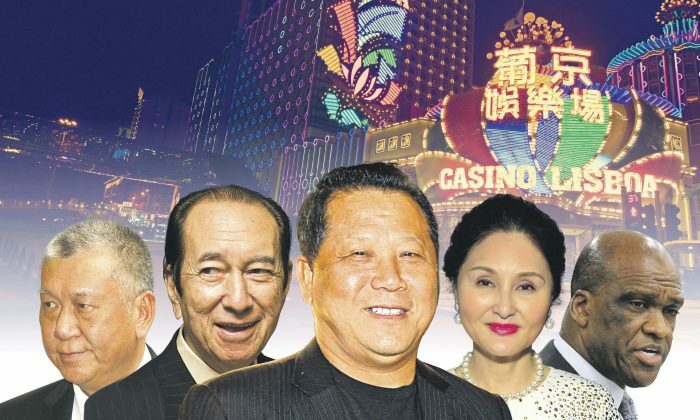 Macau, which is separated from Hong Kong by only a strip of water, has always been considered a main channel of corruption and money laundering for CCP officials. Earlier this year, the Chinese Central Discipline Inspection (CCDI) stationed a team leader of discipline inspection in the State Council of Hong Kong and Macau for the first time. The team leader, Li Qiufang, recently told the media that the corruption within the system in Hong Kong and Macau is under investigation. Meanwhile, a few major cases were cracked in Macau. These include the breakthroughs in Ng’s complex bribery scheme, the imprisonment of the nephew of Macau casino tycoon Stanley Ho for manipulating prostitution, and the arrest of former Macau Attorney General Ho Chio Meng for corruption. All of these cases are related to the Macau business and political forces of former CCP leader Jiang Zemin and his supporter, former Chinese Vice President Zeng Qinghong. On March 16, 2016, Francis Lorenzo, a deputy permanent representative of the Dominican Republic to the United Nations, pleaded guilty to assisting Ng in bribing Ashe. A Chinese female suspect was arrested on March 17. The latest development reveals that Hong Kong has also been involved in the case. On March 18, a China-born woman, Julia Vivi Wang (alias Vivian Wang), the vice president of two U.N. non-governmental organizations (NGOs)—South-South News and the International Organization for South-South Cooperation (IOSSC)—was charged with paying half a million U.S. dollars in bribes to buy Antiguan diplomatic positions in Hong Kong for her husband and another man. The indictment alleged that in 2012, Wang began to use the New York bank accounts of the two NGOs to receive funds from China and bribe two U.N. officials, Ashe and Francis Lorenzo. Lorenzo was the president of the two NGOs. The New York Times reported that Ashe emailed Wang in March 2013, attaching a letter to her husband that said Antigua was going to open an “investment office” in Hong Kong and that he would be appointed economic envoy or honorary consul. The other Chinese businessman would be appointed deputy. According to Lorenzo, this position can help people acquire citizenship through investment and business arrangements. The report also mentioned that more Antiguan government officials, including the former Prime Minister of Antigua, were involved in the bribery. The case also disclosed that Ng’s foundation donated US$1.5 million to the IOSSC. After Ng was arrested, the United Nations rejected the remainder of a US$15 million offer by the foundation. Last October, U.S. authorities filed a charge against six persons, including Ashe, Lorenzo, Ng Lap Seng (alias David Ng), Ng’s personal assistant Jeff C. Yin (alias Yin Chuan), CEO of Global Sustainability Foundation Shiwei Yan (alias Sheri Yan), and Yan’s finance director Heidi Hong Piao (alias Heidi Park). Yan, Lorenzo, and Park have already pleaded guilty. Ng was allowed to post bail of US$50 million and enter home detention in the United States. Along with the startling disclosures of the inside stories of this international corruption case, a network among Ng and his political and business partners as well as the CCP’s top level officers was also extensively uncovered. Born in Guangdong Province, Ng Lap Seng moved to Macau in 1979. He established his business by selling cloth in street stalls. According to a source from the real estate sector in Macau, Ng remained very low-key in Macau and was good at spending large amounts of money to weave an extensive business and political network, which even links Ng with top-level officers in Beijing. Ng has maintained a close relationship with former Macau Chief Executive Edmund Ho and casino tycoon Stanley Ho. In the early 1990s, they together established a consortium, Nam Van Development Co. SARL The consortium featured some of Macau’s biggest names, including Board President Stanley Ho, Vice President Edmund Ho, and Ng as an executive director. Ng is a member of the Macau Special Administrative Region Preparatory Committee and was received by Jiang Zemin. Ng Lap Seng won a contract to build the Lotus Bridge, which connects Zhuhai City and Macau, one of the most important strategic projects before the communist regime took over Macau in 1999. In the opinion of Macau’s Merchant Circle, as a business assistant of former Macau Chief Executive Edmund Ho, Ng was able to win the Lotus Bridge contract and assume key duties, such as being a member of the SAR Preparatory Committee. Ng had to throw himself into the lap of Jiang. Stanley Ho and Edmund Ho are considered to be Jiang’s two major forces in Macau. Edmund Ho was designated by Jiang as the first Chief Executive of Macau and forced through the controversial anti-subversion legislation Article 23 in Macau. Stanley Ho has often been received by Jiang as an honored guest, his fourth “wife” once sang songs with Jiang, which became a popular joke. What made Ng surface in Western society was his involvement in the political contributions funnelled into the committee for re-electing President Bill Clinton, which occurred before the U.S. presidential election in 1996. Last September, Ng was arrested for bringing a huge amount of cash into the United States and was charged with a number of offenses, including bribery and tax evasion. In 2006, the Japanese media SAPIO disclosed a report detailing that the Clintons accepted large donations from Chinese spies, which also involved several top-level officials of the Democratic Party in the United States. The report bluntly pointed out that the commander of all these communist spies was Jiang. In the bribery case of John Ashe, the United Nations ordered an investigation on Chinese Australian businessman Chau Chak Wing, the boss of Guangzhou Kingold Group, as Chau was alleged to have bribed Ashe to attend a meeting in Guangzhou City. According to China issues expert Shi Cangshang’s analysis, Chau has been engaging in overseas political tasks for Zeng Qinghong and the Jiang faction. Similar to Ng, Chau is Australia’s largest overseas political donor, having donated millions of Australian dollars to the Australian Liberal Party and the Labour Party. In the 1970s, Chau immigrated to Hong Kong from China and then to Australia. He shuttled between Australia and Guangzhou since 1989, Chau maintains a close personal relationship with Wang Xiaoling, a niece of Zeng Qinghong’s wife. Wang Xiaoling’s luxurious 300-square-meter dwelling in Guangzhou was constructed by Chau’s company. Chau not only paid 3 million Chinese yuan (US$460,000) for the renovation, but also allowed Wang to pay only 20 percent of the house price. The aforementioned accused woman Sheri Yan, who is Chinese American, is the wife of a former Australian Embassy diplomat. She also worked for Chau for five years. Yan is an Australian social celebrity. The foundation she worked for keeps close contact with many businessmen and politicians in mainland China. According to the Sydney Morning Herald, Yan’s husband, Roger Uren is a media executive and former Australian intelligence analyst who was once tipped to become Australian ambassador to Beijing. He is now working for the Hong Kong-based CCP mouthpiece Phoenix Television. Translated by Thomas Leung. Edited by Sally Appert.